Pets are family too and deserve a final resting place. We understand how horrible the loss of a pet can be and look to provide closure through offering all our memorial services to accommodate the loss of a pet. 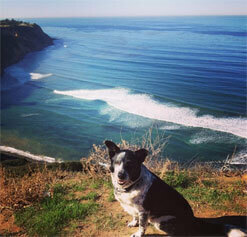 Our family dog Duke loved walks by the beach, and hiking the Palos Verdes cliffs, and that’s why when his day came, we laid him to rest at sea in front of his favorite hiking trails. All our Memorial services are available to accommodate the loss of a pet. Depending on what memorial at sea service you chose, you will receive a certificate stating the Global Position System (GPS) coordinates of where the scattering took place. The certificate is received within 14 business days of the scattering date.